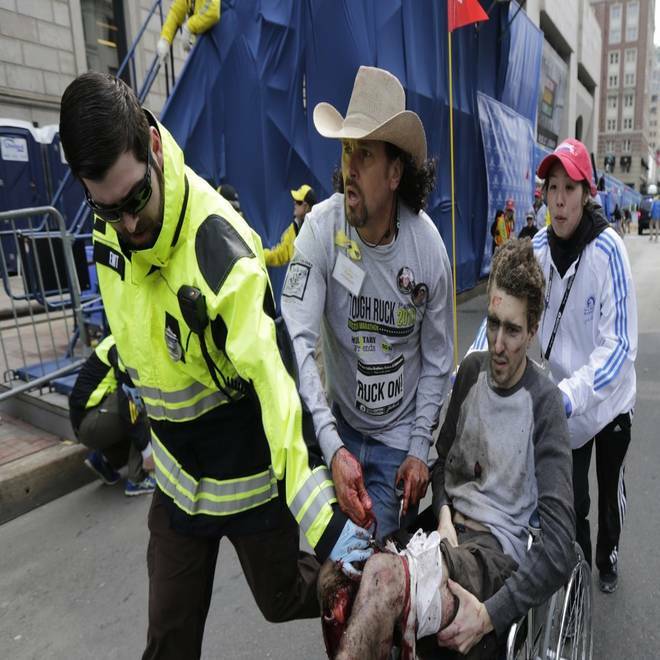 Carlos Arredondo helps a victim of the Boston Marathon bombings on Monday. It’s an iconic image that captures a moment when one Boston Marathon bystander became much more. With blood-soaked hands and wearing a cowboy hat, Carlos Arredondo helps rush a young man in a wheelchair to safety after explosions turned Monday’s race into a disaster scene. He appears to be pinching closed a severed artery protruding from the victim’s thigh, stanching the flow of blood from a torn and shattered leg. "I kept talking to him. I kept saying, 'Stay with me, stay with me,'" Arredondo told the Portland, Maine, Press Herald. 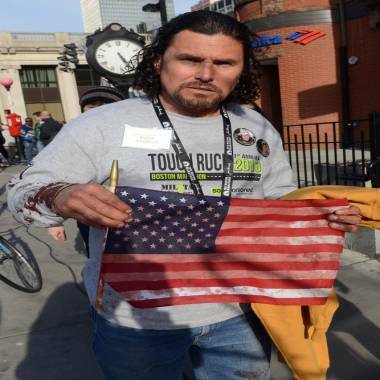 Carlos Arredondo displays a blood-soaked flag. He had been handing them out when explosions ripped through areas near the finish line of the Boston Marathon on Monday. Another frequently published photo shows him afterward, carrying an American flag soaked in blood. Arredondo had been at the race to support a group running for fallen veterans, one of them his son, according to the Maine newspaper, which described him charging in to help the wounded after the explosions. Afterward, he was shaking, sometimes violently, as he told bystanders what had happened. Arredondo didn’t set out to become a heroic figure – or a tragic one, for that matter. Life dealt the Costa Rica native the cards that brought him national media attention long before Monday. In 2004, Arredondo’s son, Marine Lance Cpl. Alexander S. Arredondo, died in battle in Najaf, Iraq. When Marines arrived in a van to deliver the news, on Arredondo’s 44th birthday, he grabbed a can of gasoline and a torch from his garage, climbed inside the van and doused it, then set fire to it, severely burning himself in the process, The Associated Press reported at the time. Boston Marathon blast witness Carlos Arrendondo describes rushing into the aftermath to aid victims. WJAR's Brian Crandall reports. The New York Times wrote about Arredondo in 2007, finding him a man distraught who was manning a makeshift mobile memorial in the back of his pickup. There was a coffin containing his son’s favorite possessions, and then there were the photos. They depicted Alexander Arredondo as a happy teen, then as a fully-battle-equipped warrior, then as a body in a coffin. “As long as there are Marines fighting and dying in Iraq, I’m going to share my mourning with the American people,” he told the paper. Public grieving would gain him national attention, but it wouldn’t be easy. In 2007, Arredondo was publicly beaten during an anti-war demonstration in Washington, according to WarIsACrime.org, which carries photos of the incident and an account from Arredondo’s wife. And in December 2011, just before Christmas, Carlos’ other son, Brian, 24, took his own life as U.S. troops were withdrawing from the war that left his brother dead, according to numerous media reports. “We are broken people,” he told The Boston Herald.